Welcome to the next edition of breastfeeding stories from our readers. These memories are shared by breastfeeding moms, who like myself wish to spread the word to new moms that breastfeeding can have its challenges, but it is worth practicing, seeking help, asking for support and looking for answers. We all know the benefits of breastfeeding, but we do not instinctively know how to successfully breastfeed. We need help, advice, support and guidance – even if it is our second, third or fourth baby. Please let us know if you have a breastfeeding story you would like to share – we will link back to your blog, if you are a blogger. This series will be featured every Monday until we run out of stories! I have been thinking a lot about breastfeeding. A lot. But thankfully, I had taken a hand pump home from the hospital, and my sister-in-law had given me a dual electric pump. We ordered some parts online, and soon I was a pumping machine. I had worked my way into pumping 5 times per day with plenty for Elliott during the day and night, and always room to put a little in the freezer for later. I pumped at first in the middle of the night, but after a while, I didn’t even have to do that! My body knew when I needed to pump and how much to produce. I was still devastated that Elliott would not breastfeed, but I was consoled by the fact that at least he was getting the best food possible. 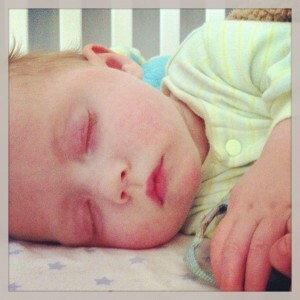 Then, when Elliott was 8 weeks old, he got sick and went to the hospital for two and a half weeks. We learned that Elliott had a heart condition. It shed a lot of light on why Elliott did not latch properly. The truth is babies with heart defects often do not breastfeed well because it’s just too hard for them. They burn more calories than they take in because they tire faster. Something happens to you when your kid lands in the hospital: you become emotionally distraught. You spend your days at the hospital and you forget to pump while you’re there. You eat terrible food or you don’t eat at all. You don’t hydrate yourself. Your child isn’t eating, instead they are being fed nutrition and fats via IV. You can pump in the hospital but they won’t always let you into your kid’s room to get your pump kit, or the pump room is being used. You don’t pump routinely because you’re soaking up moments when your child is awake or having many, many conversations with doctors. Pumping becomes less of a priority and your supply starts to taper. That was what happened to me. At best, I was pumping three times a day. I would pump when I woke up and before bed at home, but a full day at the hospital would lead me to pump once or not at all. This was fine at first, because Elliott wasn’t being fed. When they finally bottle fed him I was forced to be conscious of pumping more often, and I was barely able to keep up. When Elliott was home for two weeks between hospital stays I had to dig into my frozen supply to keep up, and that really bummed me out. Now that Elliott is in the hospital again I am trying to be more aware of my pumping, but it’s tough. My supply is dwindling and hasn’t fully recovered from that first stay in the hospital. When all of this started, I proposed to myself that I would commit to 6 months of pumping at the very least, and see how I felt about it after that. Maybe continue, or wean off as babies are starting to eat other foods at that point anyway. I knew that whenever I went back to work I would be supplying Elliott’s caretaker with breast milk, and that formula would be waiting in the wings as a last resort. Now, I am not sure what to do. While breast milk is better, formula is easier. I am going to have to go back to work shortly after Elliott is released from the hospital, and pumping takes valuable moments away from time I could spend with Elliott. At home I would pump while Elliott napped or stuck him in his swing to entertain himself. And now, I will have to pump much, much more to get back up to where I was. I almost lost this little boy, two times, and I am currently weighing what is more important… breast milk, or quality time with him. And I’ll just come out and say this about pumping: I don’t want to do it anymore. I am certainly going to pump while he’s in the hospital, and I’ll continue after. I am just not sure how long. Formula will be there if I need it, but the thought of giving him formula still crushes me. I am just not sure. Just not sure. Having a child with a heart condition affects every aspect of your life, but there isn’t a thing I wouldn’t do for that little boy. I am learning all too well that parenting is about making decisions, and weighing what is best for your child. I never thought it would be this hard, and I never thought I would have to make decisions about breastfeeding so early in Elliott’s life. Life will go on, and before too long Elliott won’t be subsisting on bottled food at all. So for now, I’ll just pump my little heart out.